Caricatured drawing of a notorious incident in Heaton, Newcastle upon Tyne. It shows Cuthbert Lambert, a young customs officer, whose horse accidentally jumped off the side of a bridge. 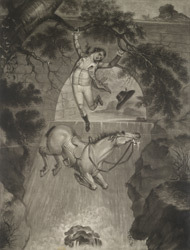 The horse did not survive, but Lambert did, breaking his fall on an outstretched branch. This incident gave the spot between Sandford Road and Portland Road its colloquial name: Lambert's Leap.